“The Moving Wall” is the half-size replica of the Washington, DC Vietnam Veterans Memorial and has been touring the country for thirty plus years. When John Devitt attended the 1982 dedication in Washington, he felt the positive power of “The Wall.” He vowed to share that experience with those who did not have the opportunity to go to Washington. Devitt’s idea was deeply personal. He had been out of work when the Wall was dedicated, and had made the trip with financial help from family and friends. “There were millions of people who would never be able to come to Washington,” he realized, “I wanted them to be able see and feel what I had.” His emotions ran deep. “Before 1982 I never felt like I needed a parade or a memorial,” he said. He had come to the Wall expecting to dislike it, anticipating it would be as some media stories had said, “a black gash of shame.” Instead, the Wall changed his life; it gave him a new mission and sense of pride in his military service. Students, in cooperation with faculty and veterans, will act as Visitor Guides at The Moving Wall. 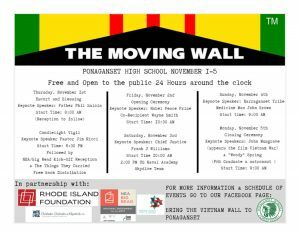 The Moving Wall will be open to the public 24 hours a day starting at 9 a.m. on November 1 through 6 p.m. on November 5. “The Flames of Freedom” bonfire will be lit each night at 6:30 p.m. to honor and remember the near 59,000 names inscribed on the Moving Wall. Contact Chris Stanley at cstanley@fgschools.com for more information.